GOLFZON (CEO: Jang Sung Won), a leading provider of golf simulators, held a ceremony on August 13th (Korean time) to celebrate the installation of VISION and GDR(Golfzon Driving Range) Systems at Hong Kong International Airport Terminal 2. The ceremony was carried out by GOLFZON’s official distributer of Hong Kong, GreenLive, which sold two VISIONs and one GDR systems for installation at Hong Kong International Airport. GOLFZON had previously installed golf simulators two times in Hong Kong, the first in Lai Chi Kok (10 VISIONs and 5 GDRs system) and the second in Kwun Tong (4 VISIONs and 10 GDRs systems), and had successfully been operating its indoor golf practice range business. By setting up VISION and GDR Systems opened at Hong Kong International Airport, the insiders of GOLFZON and GreenLive anticipate that the airport users will experience the excellent technology of GOLFZON and feel the pleasure of golf as Korean young golfers and world-class female professional golfers do with VISION and GDR systems. 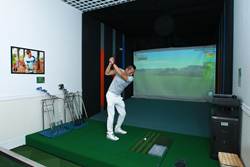 GOLFZON’s VISION is a screen golf simulator that helps players to enjoy vivid experience of golf rounds indoors. GDR is a golf practice simulator that provides accurate analysis on hit distance, trajectory and quality for each club which helps users to systematically practice golf by themselves. “Based on our golf simulation technology and expertise that place us at the top in the Korean market share, we will increase our global market share not only in Asia and the Pacific regions, but also in America and Europe,” said Lee Min Seop, vice president, at the ceremony. By installing VISION and GDR system at the Hong Kong International Airport, GOLFZON will focus on publicizing the excellence of its system in Hong Kong, while at the same time expanding its sales and business opportunities overseas.